Off-the-track Thoroughbred, Chipawild is very quiet and not wild. Chipawild is doing very well. Doing lead changes and starting to jump small courses. 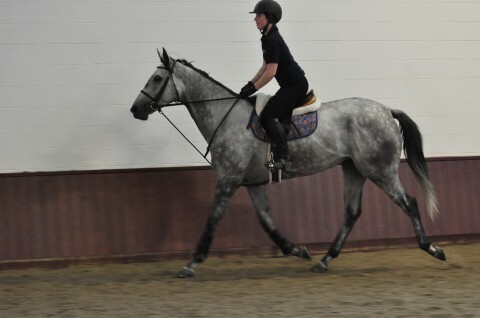 My daughter’s trainer says she is very easy and learns quickly – only has to be shown things once. She still needs a lot of leg and the professional who schools her says she needs to push all the time at the canter to keep her from breaking – maybe why she wasn’t the fastest! I was up in Mass yesterday and saw here for the first time in quite a while. She still needs more weight but nonetheless he is moving in the right direction and her coat looks good. She has a few marish tendencies when being grooming (which is just like my daughter’s move up from a pony horse who is a Canadian many years of the track OTTB) but my daughter adores her and loves fawning over her (although I think the mare only puts up with the fawning!). It is just great for me how happy my daughter is with this horse. Although she had many ponies and horses and showed a lot growing up I think this is the first horse she feels is really HERS (an adult sort of “hers”) and it wonderful to see her begin to mature as a horsewoman being (mostly) in charge of her own horse.